I have vivid childhood memories of playing basketball in my backyard. My father would work with me on the fundamentals and my brother and I would go at it playing one on one. Born in Houston, Texas to Leo and Mary Ford, Terrance Jerod Ford was nicknamed "T. J." at birth by his mother. From a young age, Ford dreamed of being a basketball player, having also witnessed his home team Houston Rockets win back-to-back championships in the 1990s. Ford first played competitive basketball at Willowridge High School, and helped Willowridge to a 75–1 win–loss record (including a 62-game winning streak) in his final two seasons, earning a pair of Texas Class 5A state titles in the process. Subsequently, Ford was diagnosed with spinal stenosis, but he went on to play basketball for the Texas Longhorns for the 2001–02 and 2002–03 seasons. In his first season at Texas, Ford not only led the team in steals and minutes per game, he became the first freshman player in NCAA history to lead the nation in assists (8.27 per game). Ford's play ensured that Texas made it to the Sweet Sixteen, while he recorded 15 double-digit assist games, and was named a consensus Big 12 Freshman of the Year. In 2003, the sophomore was third in the nation in assists (7.7 per game), and led the Longhorns in scoring, assists and steals. Ford was also the South Regional MVP while leading Texas to its first Final Four since 1947. At the end of the season, the consensus First Team All-America selection won the prestigious Naismith College Player of the Year and John Wooden awards, and was named Player of the Year by Sports Illustrated, The Sporting News, ESPN.com and CBS SportsLine. To honor Ford, his #11 jersey was retired by his university, making him the fourth University of Texas athlete in any sport (and the first basketball player) to have such an honor, joining Earl Campbell, Ricky Williams, and Roger Clemens. Having felt he had nothing more to prove at college level, Ford decided to turn professional after his second year of college to enter the 2003 NBA draft, and was heralded by NBA.com as having "the prescient ability to see the play before it happens, like Magic Johnson and Larry Bird". Ford was picked eighth in the first round by the Milwaukee Bucks in a very strong draft class, which featured future NBA All-Stars LeBron James, Dwyane Wade, Chris Bosh and Carmelo Anthony. In his first season, he led the Bucks in assists with 6.5 assists per game, while tallying 7.1 for points per game (ppg). Ford was also selected to the NBA All-Rookie 2nd Team. However, he played in only 55 games that season before an injury forced him to miss the final 26 games of the regular season and the 2004 NBA Playoffs. The injury occurred on February 24, 2004, during a home game versus the Minnesota Timberwolves where he fell on his tail bone after being fouled by center Mark Madsen. He suffered a contusion of the spinal cord, a career-threatening injury. Ford sat out the entire 2004–05 season due to his spinal cord injury. In June 2005, a statement was released by Dr. Robert Watkins of the Los Angeles Spine Surgery Institute that said Ford had made a complete recovery. The point guard had trained intensively for months in his hometown of Houston under the supervision of former NBA player John Lucas; together they worked on Ford's shooting, stamina, and strength. Ford rejoined the Bucks when training camp opened, and in his first game back on the court on 1 November 2005 he was one rebound shy of a triple double (with 16 points, 14 assists and 9 rebounds in 34 minutes of play) in a 117–108 Milwaukee road win over the Philadelphia 76ers. As the season progressed Ford showed almost no effects from his injury, playing with the same intensity and hustle as he did in his rookie season. He ended the regular season with 12.2 ppg and 6.6 apg, but found that the Bucks had abandoned a fast-paced style of offense. New coach Terry Stotts was beginning to rely more on the jump shooting of Michael Redd, the post play of Andrew Bogut and Jamaal Magloire, and the playmaking of developing point guard Mo Williams, so that Ford became a less important component of the team. In a way, all my lifelong battles with my spinal problems were a blessing in disguise. It made me appreciate the game more, that I'm still given a chance to play it at the highest level. And in every game, that always makes me want to give it everything I've got. Following the 2005–06 season, newly appointed Toronto Raptors general manager Bryan Colangelo overhauled Toronto's roster in preparation for the 2006–07 season. He was looking for a true point guard, and acquired Ford in exchange for promising Raptors forward Charlie Villanueva. This trade was initially criticised by basketball observers as "lopsided" due to Ford's injury history, but Ford was installed as the starting point guard for the Raptors, and together with Chris Bosh, the duo formed the centerpiece of the Raptors' offense. Ford also forged a solid partnership with sophomore and fellow point guard José Calderón, the latter backing him up when Ford was injured for several games in the middle of the season. Apart from his quick speed (Ford was voted the fastest player in the NBA in a 2007 Sports Illustrated survey of 271 NBA players), Ford's clutch play was instrumental for the Raptors throughout his inaugural season. On 20 December 2006 he scored the winning basket against the Los Angeles Clippers and two days later, converted almost every shot in overtime and provided the vital assist in the win against the Portland Trail Blazers. Ford's clutch play was again evident in a 120–119 overtime win against the Seattle SuperSonics on 11 March 2007 when he scored almost all of the team's overtime points. His form continued when he equaled his career-high of 18 assists in a game against the New York Knicks on 14 March 2007 — one short of the Raptors franchise record set by Damon Stoudamire. Ford ended the 2006–07 regular season with 14.0 ppg and 7.9 apg, both career highs, and was also credited with bringing the Raptors to their first playoff berth in five years, as well as helping them clinch their first ever Division title. In the 2007 NBA Playoffs, he averaged 16.0 ppg and 4.0 apg, but Toronto lost four games to two to the New Jersey Nets in the first round. Prior to the 2007–08 season, Ford focused on improving his turnover-to-assist ratio. When the season began, coach Sam Mitchell continued to rotate between Ford and Calderón to good effect. On 11 December 2007, following a flagrant foul committed by Al Horford, Ford suffered what appeared to be a serious injury in a game against the Atlanta Hawks. He was conscious but did not appear to move before he was strapped to a stretcher and wheeled off the court. In his absence, Calderón earned rave reviews for his performances and surpassed Ford as the starting point guard for the Raptors. However, after spending several weeks with his old trainer John Lucas in Houston, Ford made his return on 4 February 2008 to the bench. By the end of the season, there was much speculation that the Raptors would try to trade Ford, originally a central piece of the Raptors' long-term plans, and rebuild their team around the more efficient Calderón. In the 2008 NBA Playoffs, Toronto was pitted against the Orlando Magic in the first round and the perception was that Toronto's depth at the point guard position could prove to be key. While Ford played poorly in the first two games which the Raptors lost, he was pivotal in the third, bringing the series score to 2–1. The Raptors, however, were eliminated in five games, and the coaches' decision not to deploy Ford to close out games during the playoffs—coupled with Ford's subsequent alleged refusal to play backup on the team—led to further speculation about his future. On the eve of the 2008 NBA draft, it was reported that the Raptors had traded Ford to the Indiana Pacers in exchange for Jermaine O'Neal and the 41st pick in the draft (Nathan Jawai). The Raptors sent Indiana Rasho Nesterovič, Maceo Baston and the 17th pick in the draft (Roy Hibbert), and because Ford's contract made him a "base-year compensation" player, the trade was only finalized on July 9, 2008. Ford got off to a good start with his new team, with the Pacers alternating between him and Jarrett Jack for the starting point guard position. While the occasional injury prevented Ford from performing at the optimal level all the time, he was able to keep up his game of attacking the basket. On February 1, 2009, he scored a career-high 36 points in a game against the New York Knicks, a week after tying his previous career-high of 34 points. However, the Pacers were eventually edged out of playoffs qualification by Detroit. The bright spot in Ford's first campaign with the Pacers was his recording of a career-best in points per game. On December 9, 2011, Ford signed a contract with the San Antonio Spurs. On March 12, 2012, after playing 14 games, he announced on Twitter that he would retire. He suffered from a stinger after being elbowed in his back by Baron Davis during a game against the New York Knicks on March 7, 2012: "If it's anybody else, it's just a regular play. But because of me and my condition a simple elbow in the back has a different outcome than hitting someone else in the back." On March 15, 2012, Ford, Richard Jefferson and a 2012 first-round pick were traded to the Golden State Warriors. Ford was then waived by the Warriors. During the 2011 NBA lockout, Ford signed to play with KK Zagreb of Croatia. 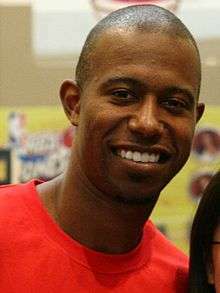 Ford started the T. J. Ford Foundation in September 2004, an organization that seeks to enhance individuals through programs designed to develop their educational, recreational, physical and social well-being in collaboration with family and community. The Foundation has a presence in Texas and Wisconsin. Elsewhere, Ford is mentioned by rapper Paul Wall in the song "Get Aphilliated" in which Wall raps: "I'm like that T. J. Ford, I'm deadly on them threes"
1 2 3 BIO, tjfordlive.com, accessed 8 September 2007. ↑ texassports.com biography, texassports.com, accessed 23 February 2010. 1 2 3 4 5 T. J. Ford Info Page - Bio, nba.com, accessed 29 April 2007. 1 2 3 4 Jay, Paul, "Ford the new engine for high-octane Raptors", cbc.ca, 31 October 2006, accessed 4 September 2007. 1 2 3 4 5 Brady, Erik, "Ford motors toward NBA return", usatoday.com, 30 October 2005, accessed 29 April 2007. 1 2 3 4 5 Prospect Profile: T. J. Ford, nba.com/draft2003, accessed 1 September 2007. ↑ Melanie Boehm, "Ford gets No. 11 jersey retired one season after Final Four berth", dailytexanonline.com, 9 February 2004, accessed 29 April 2007. 1 2 3 4 5 T. J. Ford Info Page - Career Stats and Totals, nba.com, accessed 8 September 2007. 1 2 TJ Ford, hoopshype.com, accessed 3 September 2007. ↑ "Ford Cleared For Full-Contact Basketball", nba.com/bucks, 27 June 2005, accessed 29 April 2007. ↑ Bucks 117 76ers 108, nba.com, 1 November 2005, accessed 4 September 2007. ↑ Luis, Ernest, "NBA Madness... Up Close & Personal", The New Paper, 2 September 2007. ↑ "Raptors Acquire T. J. Ford and Cash from Milwaukee in Exchange for Villanueva", nba.com/raptors, 30 June 2006, accessed 5 May 2007. ↑ Smalls, Anthony, "The Rebirth of the Raptors", nba.com, 12 April 2007, accessed 8 September 2007. ↑ Raptors Post Up, nba.com/raptors, 21 March 2007, accessed 8 September 2007. ↑ SI Players Poll, sportsillustrated.cnn.com, 20 February 2007, accessed 29 April 2007. ↑ Raptors 98 Clippers 96, nba.com, 20 December 2006, accessed 4 September 2007. ↑ Raptors 101 Trailblazers 100, nba.com, 22 December 2006, accessed 4 September 2007. ↑ Sonics 119 Raptors 120, nba.com, 11 March 2007, accessed 4 September 2007. ↑ Raptors Post Up, nba.com/raptors, 14 March 2007, accessed 29 April 2007. ↑ Smith, Doug, "Ford has rough ride to playoffs", thestar.com, 20 April 2007, accessed 29 April 2007. ↑ Jefferson, Nets Eliminate Raptors, nba.com/playoffs2007, 5 May 2007, accessed 4 September 2007. ↑ Smith, Doug, "Being a better leader Ford's focus", thestar.com, 19 October 2007, accessed 21 October 2007. ↑ Odum, Charles, "Ford Seriously Injured as Raptors Finish Off Hawks", nba.com, 11 December 2007, accessed 12 December 2007. ↑ Millson, Larry, "Raptors romp in Ford's return", globesports.com, 5 February 2008, accessed 5 February 2008. ↑ Raptors Cut Magic's Lead to 2-1, nba.com, 25 April 2008, accessed 1 May 2008. ↑ Smith, Doug, "Colangelo: Sam's safe 'for now'", thestar.com, 30 April 2008, accessed 1 May 2008. ↑ Perkins, Dave, "Point guard protocol top Raps issue next season", thestar.com, 30 April 2008, accessed 1 May 2008. ↑ Sources: Pacers agree to O'Neal-for-Ford swap with Raptors, sports.espn.go.com, 25 June 2008, accessed 26 June 2008. ↑ Wells, Mike, "Healthier Ford going to basket more", indystar.com, February 1, 2009, accessed February 5, 2009. ↑ "T.J. Ford Announces Retirement On Twitter". Sports Illustrated. March 12, 2012. Retrieved March 12, 2012. ↑ "Injured again, T.J. Ford will retire". ESPN. March 12, 2012. Retrieved March 12, 2012. ↑ "NBA's T.J. Ford retires as medical precaution". USA Today. March 12, 2012. Retrieved March 12, 2012. ↑ "Warriors Acquire Richard Jefferson, T.J. Ford And 2012 First Round Pick From San Antonio". NBA.com. March 15, 2012. Retrieved March 16, 2012. ↑ TJ's Causes, tjfordfoundation.org, accessed 8 September 2007. 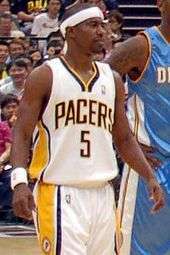 Wikimedia Commons has media related to T.J. Ford.